Is it or isn’t it? Only statisticians know for sure. This entry was posted on April 6, 2014 by Tintean Editorial Team/FA, in Economy and tagged Emigration, Great Financial Crash. Bookmark the permalink. Just over two months ago, Fintan O’Toole, journalist and long-standing critic of the Celtic Tiger,condemned the much touted Irish economic recovery as so much blarney and Ireland’s latest quarterly financial figures strongly suggest that he may have been right. 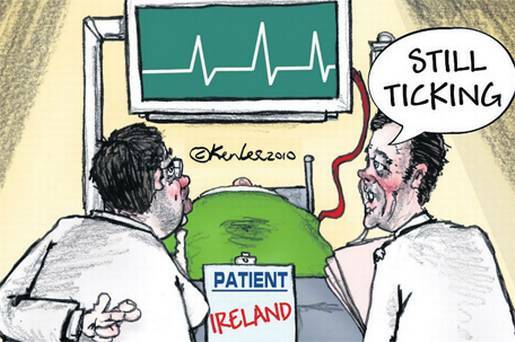 Ireland tentatively emerging from its long slump, it is being cited as the great exemplar of the virtues of austerity. Conceding that foreign owned companies had come to Ireland and done very well, he reminded the world that Ireland now effectively has two economies – a foreign investment one and the other one where most Irish people have to make a living. The latter is not doing well at all. Wages for Irish based workers have dropped sharply, nevertheless unemployment remains at 12.8% – twice the figure that is now causing all the worry in Australia. It’s also worth noting that cutting Irish wages did not promote employment, despite all the promises by neoconservative economists that cheapening the cost of labour would mean that more people would get jobs. Rather than the financial returns, O’Toole believed that the best measure of the country’s success was the emigration figure and commented that ‘Other people protest in bad times; the Irish leave.’ On that basis the Irish economy is doing very badly indeed because people have been leaving in droves, particularly those people who would normally be the powerhouse of economic activity – the young and the well-qualified, in other words, the very people that no country can afford to lose. Since 2008, approximately 9% of Ireland’s population have emigrated – that’s an awful lot for any country to lose in such a short time. Most of the people who have recently left Ireland are university graduates who had been in full-time work when they made the emigration decision, but they just did not believe in the success ‘story’, or as O’Toole put it ‘they just don’t buy into the narrative of a triumphant rebound’. If they’re at all numerate, it’s hard to see why they would believe it. Let’s put the extent of Ireland’s debt hangover from the Great Financial Crash of 2008 into context. The whole of the European Union has established a fund of €75 billion to back possible bank failures in all of their member states. 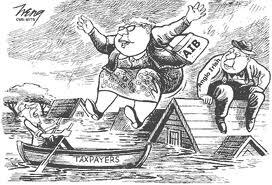 Tiny little Ireland has spent, or has promised to spend, the horrifying sum of €85 billion on bailing out its own banks. O’Toole described the decision to bail out bad banks at all costs as ‘catastrophic’ and its easy to see why he thinks that way – the national debt has doubled despite the way services for citizens have been slashed. So what do the latest quarterly financial figures say? Frankly they are not encouraging, whichever ones you choose to emphasise. In 2013 Irish gross domestic product (GDP) fell by 0.3 per cent – suggesting that the Irish economy, far from recovering, has fallen back into recession – even its defenders concede that it is ‘technically’ once more in recession. Economists had been expecting a far better performance than that – the general Eurozone actually managed to grow a little bit in 2013, but Ireland’s economy shrank. So why is this happening? Well, it seems that the multinationals who have moved in to take advantage of the low company tax regime are no longer doing as well as before, particularly the big pharmaceutical companies. Most of the world’s supply of Lipitor (a widely prescribed cholesterol lowering drug) is now made in Ireland, but the market for it has recently dropped dramatically (about 60%), for reasons unknown. As a result, Pfizer’s profits alone fell by $5.5 billion and the profits of other pharmaceutical companies based in Ireland also fell. Changes in drug prescribing fashions cannot be the whole story because the amount of money repatriated by all of the foreign companies now based in Ireland fell by nearly 17% in 2013. Unsurprisingly, the Irish Minister for Finance Michael Noonan has chosen to ignore the gloomy GDP results and stress the brighter GNP figures. Why does he prefer one set of figures over another? Of course there’s always the chance that the punters won’t particularly notice the quick change of a consonant in the middle of the speech, but what is the real difference between the acronyms? Gross Domestic Product (GDP) is the figure normally used to measure economic activity and refers to a country’s total product whether this is carried on by nationals or foreigners. Gross National Product (GNP) describes the total product (goods and services) by the residents of a country, whether they produced them within its borders, and allocates production based on ownership. Given the widespread existence of overseas based firms and their major contributions to most national economies, the GNP is a rather limited measure and is not often referred to. Nevertheless, according to Noonan, the GNP has suddenly become the true indicator of the country’s health. No wonder he wants to emphasise it because it’s been doing well – growing for the second year in succession, which is more than anyone can say for Irish GDP. Employment growth too has apparently been going up for the last 20 months, but this is really a puzzle because the apparently increased employment does not seem to be showing up in the national figures in the ways that one might expect. Inspiring as Noonan’s argument seems, it’s not impressing economists (let alone Irish emigrants) because there is no sign of the alleged growth of employment in the income tax figures or in domestic spending, both of which are very hard to understand. Personal consumption, which accounts for a lot of domestic spending, has actually fallen. This fall may have occurred for several reasons. For example, most of the employment growth might have occurred in low-paid sectors of the workforce, and people no longer have any spare money in their pockets or purses. It’s also possible that the first thing people do when they finally get a job is pay off debts to friends, relatives or whoever kept them afloat while they were out of work so that there’s nothing left over for personal consumption. Having paid off debt, they might then want to build a nest-egg against the next crash. These issues, of course, do not explain the absence of increased employment from the tax figures. Whatever the explanation, it seems clear that quite a few people in Ireland have yet to feel the effects of the famous ‘recovery’. The Irish firms are small and they’re not showing up in the data; they’re being swamped by huge multinationals. While there’s some support for his argument in that most of the alleged employment growth has been seen in traditional Irish-owned manufacturing sectors last year, his comment doesn’t suggest that the people running these statistics are conducting very fine-grained analyses if their most positive sector is being ‘swamped’. If Fitzgerald is right, it shouldn’t be too difficult to pull Irish owned firms out of the Irish national accounts, but he seems happy enough to speculate. Can the home team still win against the mighty odds arrayed against them? Maybe a tight corner will bring out the best of Irish determination and ingenuity, but it seems that a lot of young Irish people have given up hope and decided to leave. Felicity Allen is a member of the Tinteán editorial team.